Burial Corinth Rural Cemetery, Corinth, Saratoga Co., NY, USA, Remains removed from Jessup's Landing Cem. Tilly Houghton Jr married Charlotte Dayton in 1854. 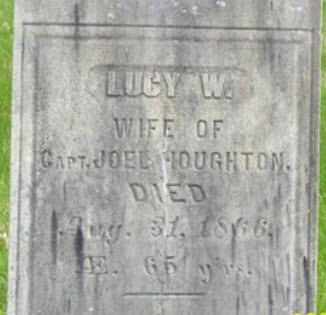 Lucy Mitchell Houghton married (?) Dayton. Lucy Mitchell Houghton married Mr. (?) Glasgow in 1864. Lydia Houghton married Dr. Simon N. Dayton in Dec 31, 1846. Christie Dayton married Dr. Nathaniel M. Houghton, son of Tilly Houghton and Lucy Mitchell, in Jan, 1846. Philomela Pettibone married Dr. James Solomon Houghton, son of Tilly Houghton and Lucy Mitchell, in Apr 12, 1852 at Rockford, Winnebago Co., IL, USA, Book I; JWH: 1849. Charlotte Dayton married Tilly Houghton Jr, son of Tilly Houghton and Lucy Mitchell, in 1854. Charlotte Dayton married Franklin Carpenter. Mr. (?) Glasgow married Lucy Mitchell Houghton, daughter of Tilly Houghton and Lucy Mitchell, in 1864. Dr. Simon N. Dayton married Lydia Houghton, daughter of Tilly Houghton and Lucy Mitchell, in Dec 31, 1846. Jonas Houghton married Hannah Collar. Capt. 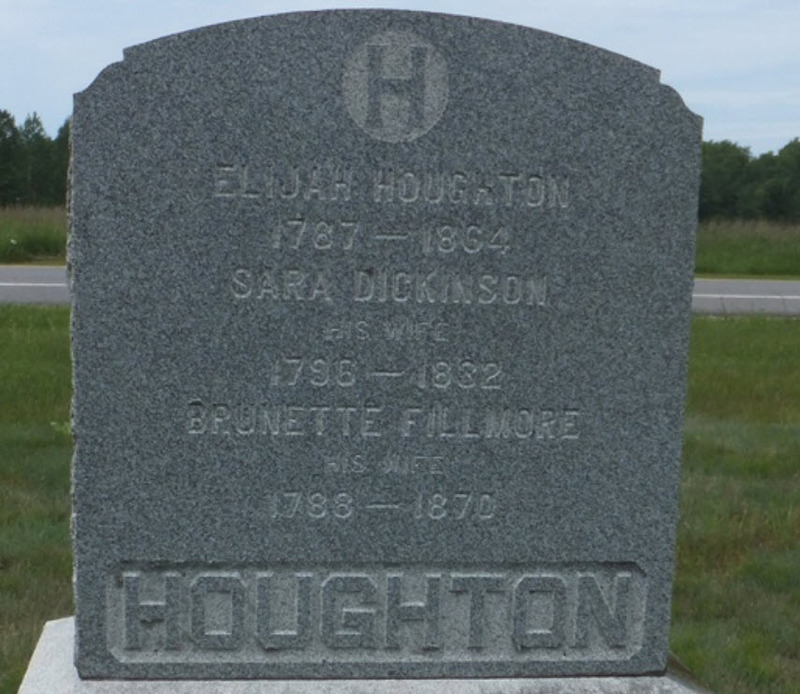 Joel Houghton married Lucy Wilder Houghton, daughter of Oliver T. Houghton and Susanna Gallup, in Apr 11, 1819 at Bakersfield, Franklin Co., VT, USA, Lucy Wilder Houghton and Joel Houghton. Dally Houghton married Anson Stetson. Nancy Houghton married James Willard. Polly Houghton married Lyman D. Hardie in Jul 5, 1829 at Bakersfield, Franklin Co., VT, USA. Elijah Houghton married Sara Dickinson. Josiah Houghton married Daphne Chamberlain in Oct 25, 1825 at Bakersfield, Franklin Co., VT, USA, Josiah and Daphne Chamberlain. Josiah Houghton married Sarah Perley. Charles Houghton married Reliance Arvilla Webster in Jan 28, 1834 at Bakersfield, Franklin Co., VT, USA. Death Aug 31, 1866 Bakersfield, Franklin Co., VT, USA, ae. 65 yrs; of consumption; Congreg. Church Rec. Lucy Wilder Houghton married Capt. 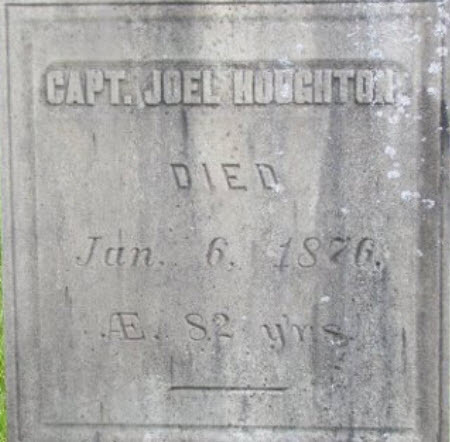 Joel Houghton, son of Jonas Houghton and Phebe Rixford, in Apr 11, 1819 at Bakersfield, Franklin Co., VT, USA, Lucy Wilder Houghton and Joel Houghton. Orilla Elmira Cornish married William Houghton, son of Jonas Houghton and Phebe Rixford, in Sep 17, 1829 at La Grange, Walworth Co., WI, USA, Orilla was first woman to marry in La Grange, WI. Anson Stetson married Dally Houghton, daughter of Jonas Houghton and Phebe Rixford. Alvira M. Stetson married W. H. McDonald. W. H. McDonald married Alvira M. Stetson, daughter of Anson Stetson and Dally Houghton. James Willard married Nancy Houghton, daughter of Jonas Houghton and Phebe Rixford. Polly Willard married Milo Lewis.